The axe is a tool as useful for felling trees as men. For this reason it is often impossible to tell between tools or weapons. Sometimes the same item may have been used for both purposes. For fighting men of warrior status their axe would probably have characteristics that made it a useful weapon. An axe is not always a weapon. For reasons we will never know many more axes are found buried in Norwegian graves of the Viking Period. However, burial customs do not relate to everyday life and it is difficult to say that the axe was a favoured weapon of any group except in the case of the English king's household troops and the Roman emperor's bodyguard. 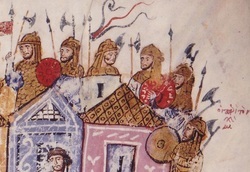 Skylitzes manuscript, from 12th century Sicily, showing Varangian guard in Constantinople. They are armed with axes. One cannot see how long the shafts are supposed to be. At this date the weapon had come to be known as a Dane Axe. Not before. Late Viking period axehead from London. Jan Pedersen includes an attempted classification of axe heads in his work 'Det Norskevikingesverd' . He takes great pains to emphasise the typology is incomplete and indefinite because axe-heads vary so much and do not always follow a chronological evolution. 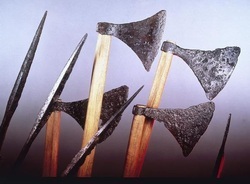 In general, however, axe-heads as weapons change to have longer edges and thinner heads in the later Viking Period. Smaller Axe-Heads with thin 'neck's, maybe extended edge. There ar emany of this form found in Gotland, some at Birka and some in Norway. Pedersen describes them as tools and some have been found in women's graves. Anthropological studies from later times indicate this type of axe is typical of a handy tool, often used by women. Read more about baby axes HERE. Axes with narrow cutting edges, heavy construction. 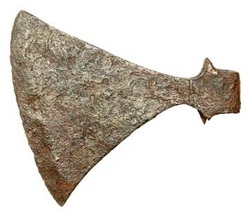 This type of axe descends from iron-age types and is a typical tool for felling and splitting. These are generally from the Early Viking Period. These axes are of very solid construction, with a broad 'eye'. The cutting edge is extended downward in the characteristic hanging 'beard'. Just looking at these in a museum makes one shudder as you realise no shield or even armour wil stop one of these if it is swung with stength. These seem to be a purposeful adaptation of tools to the function of a weapon. Later variants have a reduced 'beard'. These types are found from mid to late Viking Period..
Arcing blade form with 'eleagant' neck. Very æsthetically pleasing group. The cutting edge often curves toward th ehandle in its lower edge and the top edge of the axe often curves upward. The cutting edge is not very long but the eye often solidly made. 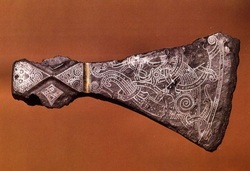 The famous Mammen axe is of this type. Its ornamentation suggests thi sis definitely a weapon, not a tool. Finishing planks with a T-axe. These axes are found as either specialist tools for working planks or as weapons in eastern areas, rarely in the west. The name associated with them, tapor or tabor is indicative they originated in areas in contact with Arabic speakers. Some have inlay, again indicating they could be weapons. 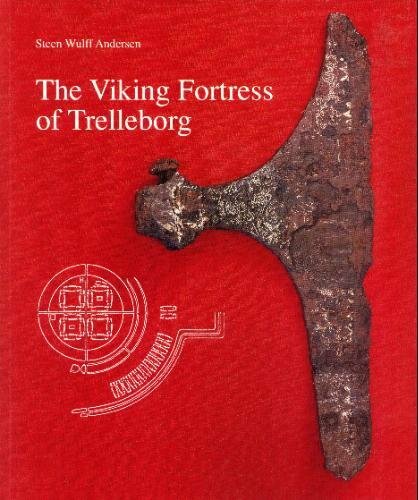 The famous axe from Trelleborg. An expensive weapon. This weapon differs from other axes due to the length of its shaft. The T-shaped war axes may have had similarly long shafts. These axe-heads are very thinly forged to make them light and they have an extended, cutting edge with pronounced tips. These weapons appear in the late tenth century and were thus not used by warriors through most of the Viking Period. They seem to have been a weapon of choice of elite troops. The English king's household troops, Arab rulers, bodyguards and the 'Axe-Bearing Guard' of the Roman Emperor. Axe-heads and shafts from Ostrów Lednicki Lake, Poland. Viking Period. Finds from Poland indicate how long axe shafts were. The T-shaped and large curved forms having shafts 1.2 metres long. (left) The red bar is 20cm long. This tallies with the depictions on the Bayeaux Tapestry. 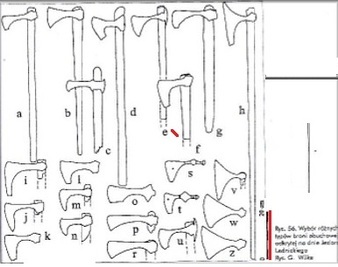 The many axes from Ostrow Lednicki may indicate a sacrificial site for Perun rather than a battle scene but 60 spears and 7 swords were also found. Axes restored in 2014. Long haft 80cm. These beautiful axes were found in Lough Corrib, Eire and have been restored with their cherry wood hafts. The longest haft is 80cm long. Used by Irishmen, they are dated to the eleventh or twelfth century. This tallies with the depictions on the Bayeaux Tapestry and Geraldus Cambrensis. These axe shafts are not taller than the wielder. They are a good deal shorter. Irishmen doing what they do best. The Lough Corrib axes in action from Topografica Hibernia by Gerladus Cambrensis c.1187AD. No extreme shaft lengths here ! 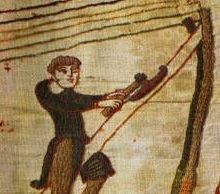 In the Bayeux Tapestry he weapon-axes with long shafts are deliberately shown as different from the tools. As the shipwrights fell trees for the fleet they areshown with narrow-bladed axes which would have a powerful head to cut into timber. The noblemen and warriors shown with fighting axes clearly have an axe head with a longer, more semi-circular edge. The tool at left and the noble weapon, centre and right. 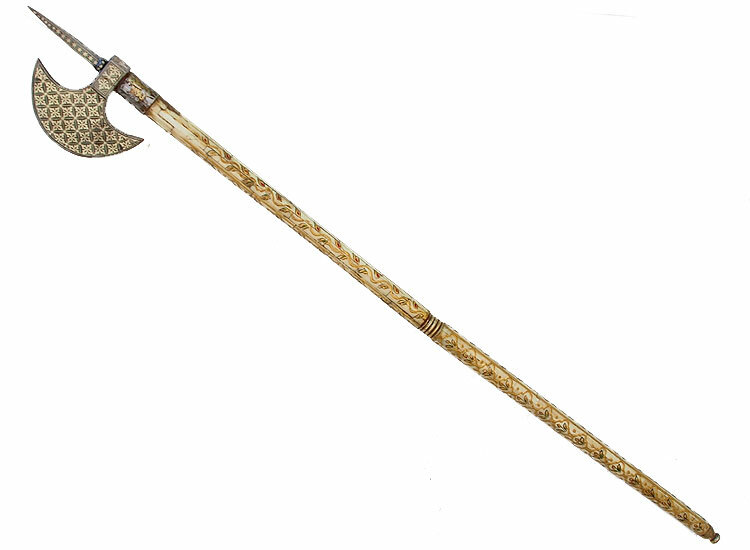 The only very long shafted axes known are those borne by the guards of Mamluk Sultans in the middle ages and Indo-Persians at later dates up to the present day. This weapon was known as the﻿ tabar﻿ and the elite foot guard who carried them were the tabardariyyah - evidently in imitation of the Roman emperor's Varangian guardsmen. The usual length for a tabar shaft was c.1m. It was a favourite secondary weapon of cavlrymen. In the twelfth century King Stephen of England was famed for having bravely defended himself with a battle axe at the Battle of Lincoln in 1141. Later in 1241 on the disastrous Seventh Crusade, the knight Jean de Joinville records that Mamluk soldiers bore something he called a 'Dane Axe' ' at their necks'. The men evidently carried the axe shafts sloped over their shoulders. How were Long-handled axes used ? Axe used in downward swing. Another man's axe-shaft is cut by a sword. We have direct evidence from the Bayeaux Tapestry that these long axes were used with over-arm downward swings. Maybe preferably from the left against the opponents open side. Probably using all the wielder's strength. The shaft was not too thick to be cut through by a sword-blow. 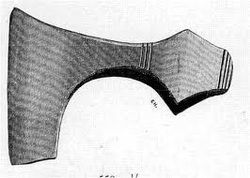 Long-hafted axes were prestige weapons. They are found buried in the richest male graves of c.1000AD in Denmark. No peasant or common fighter would have one. 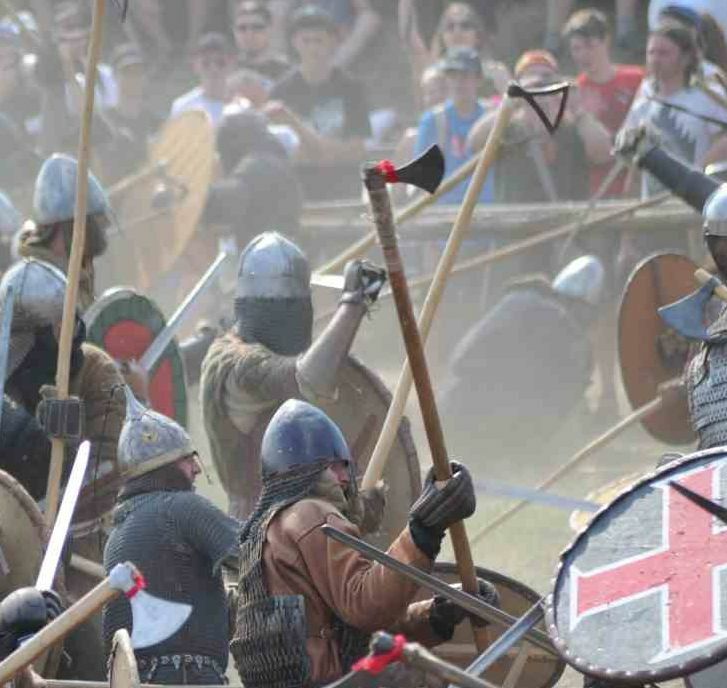 Long handled axes are popular in Viking battle reenactment but not generally used in a realistic manner. There may be good reasons for this. As with spears, using them as they were originally used is very dangerous. However, the way 'Dane -axes are used in reeactment bears no relation to how they were used in history. The long shaft has become a way of compensating for the weapon's otherwise limited effect when used in a safe manner. 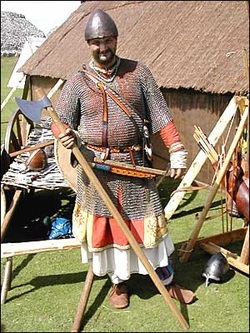 There is a tendency for 'Dane Axe' (they were never called this in the Viking Age) to develop extreme length, very heavy shafts, and techniques for wielding them which are anachronistic and ...dangerous. The use of Dane axes with underarm 'golf swings' and using the shaft to block with are directly contrary to how they were used in history. Real long-axes were shorter, lighter and the shaft stopped at top of the eye. They were not used like medieval pole-axes. In 'Eastern' fighting axes are used on long shafts and swung downwards with gay abandon. Dangerous but more historical behaviour. The axe-heads used in this case are often too small, however. Long shaft, small head - a reenactment axe. NOT authentic. Watch this video clip from mueum personnel who should know better. In his defence, the video was made before the final conservation work was complete. Firstly, he admits that these axes are Irish weapons. They are not 'Viking'. It is well attested that axes became the weapon of choice for Irish warriors in the medieval era. Second, he makes suggestions about the length of the haft without any evidence from the find. This just goes to show how far reenactment myths can penetrate 'common knowledge' .